Why do I need to use the night cream if I have this face oil? 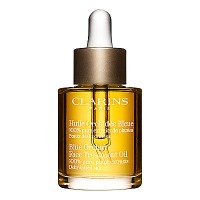 Today I’m reviewing the Clarins Orchidee Bleue Face Treatment Oil for dehydrated skin. I prefer Korean products to take care of my skin but I just couldn’t pass by this high end product. In winter, because of the central heating, my skin becomes very dry and sensitive. I’m not afraid to welcome winter as I’ve found a product that will help me to say goodbye to winter flaking and dryness! I can see the better skin effect yet there’s no moisture! I like the consistency. It’s different from the other oils. I’ll tell you more details in my review! I don’t know why but I was getting ready to write this review for so long that I’ve almost used half of the container of this oil. My skin is of combination type. It’s thin and tends to be oily in summer and dehydrated in winter. Sometimes my skin breaks out making my pores clogged. The Orchid face oil from Clarins makes my skin glow with health. It also nourishes and moisturizes! I replaced my night cream with it as I simply do not need it anymore! Natural ingredients plus adorable fragrance! 1. Product details: 2. How to use: I use the oil this way: At first I tone my face with a chamomile toning lotion from Clarins then I apply a few drops of the oil on my face. It is easy to apply as my face is still wet from the toning lotion and the consistency of the product is very smooth. It’s a product with peculiarities but I was looking for it for so long! Does this Clarins serum really hydrate well?